Kindly neighbors collected my CSA share on Tuesday. A bag full of fresh produce on your doorstep is a welcome sight after a 13-hour workday, but it was all I could do to shove the vegetables into the refrigerator alongside the remnants of last week’s haul. Tonight’s meeting was canceled, leaving me with a single, glorious unscheduled evening. I got home from class around 8:00, eager for some home cooking. 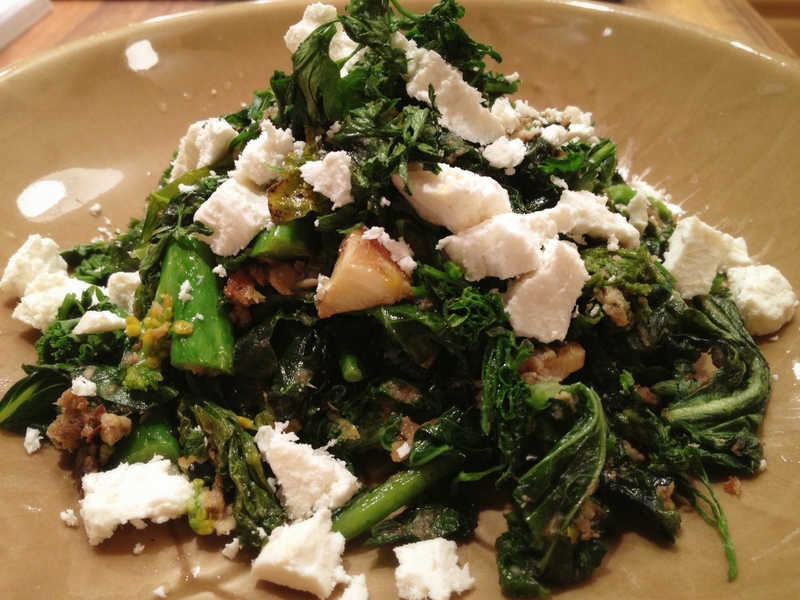 The broccoli rabe and kale from last week were looking a little worse for the wear but still edible–as were the greens that topped this week’s turnips. Now for some protein. I unearthed a can of Portuguese sardines in olive oil from the cupboard. I could work with this. Bring a large cast iron skillet up to medium heat. Open a can of sardines and drain the olive oil into your skillet. It will start to sizzle as the water cooks out of the oil. Once this has subsided, add a few cloves of thinly sliced garlic and a big pinch of red pepper flakes. Cook until the garlic slices turn a nutty brown. Add the sardines, mashing with a wooden spoon until you have a coarse paste. Rinse and roughly chop a big pile of dark leafy greens. I used the aforementioned kale, broccoli rabe and turnip greens, but pretty much any hefty greens will do. Add these to the pan, stirring between batches to wilt them and make room for more. (If any of the greens have thick stalks, be sure to add these first so that they have a little more time to cook.) Keep stirring. When the greens looks ready, add salt, pepper, the zest of half a lemon and some chopped parsley if you have it. Pile the greens in a bowl and squeeze fresh lemon juice over the top. I bet this would be tasty as a sauce for whole wheat pasta with toasted breadcrumbs sprinkled on top, but I opted for a scattering of ricotta salata, a Brooklyn Lager and an old Law and Order episode. It’s been a long week. This entry was posted in main courses, seafood and tagged broccoli rabe, greens, kale, sardines, turnip greens by Jasmine Nielsen. Bookmark the permalink.